We’re a group of machine knitters in Central Texas dedicated to helping other knitters, learning more about our craft, and doing charity knitting projects. Knit Natters is a club, not a business. There are a wide variety of knitting machines in home use. We can create beautiful afghans in just a couple hours or complicated sweaters over a weekend. Not many of these amazing machines are being produced and imported today, and there are very few dealers supporting the hobby. Fortunately, we have access to an extensive online community with tremendous expertise, and it is not very difficult to find equipment. 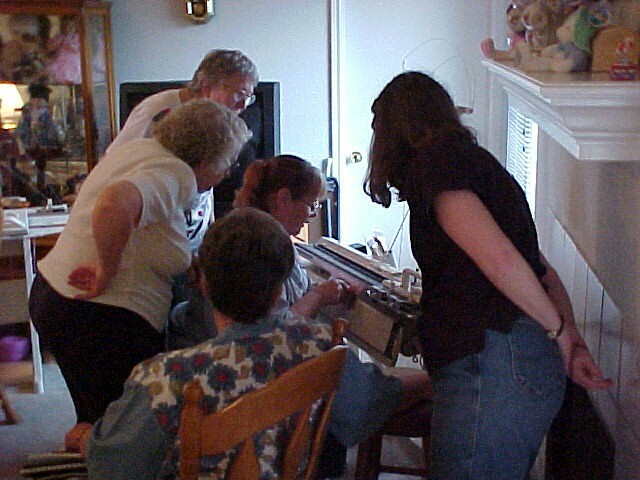 We’d like to help you learn to use your knitting machine. Beginners are always welcome! Among us, we have expertise on all the popular Japanese and Swiss machines. Several of us also use antique circular sock machines. Some of us are quite skilled on one machine - but a beginner on another machine. We meet once a month at Crystal Lake Baptist Church in Leander, Texas. Except for the December meeting, which is a party, we have a demonstration. We usually have a lesson on both the Brother and Passap machines. Everyone shares recent projects, which do not have to be knitted, and we have refreshments. Dues are $2 a meeting, which goes for postage and snacks. We welcome you to come and learn more about machine knitting!